A mysterious, one-eyed stranger wanders into Farewell, New Mexico, a dusty border town rife with corruption. He’s known only as The Preacher, an ex-Priest, ex-Special Forces commando, and now a professional gambler who has given up on his own salvation … but is determined to find justice for a murdered Vietnam vet… even if it means taking on the entire God-forsaken town. 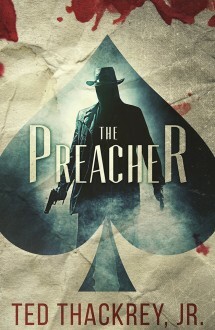 The audio book edition of the third and final book in the PREACHER trilogy. The Preacher brings his high-stakes game of death and justice to a California casino that's the temple for a deadly cult led by a brilliant psychopath with horrific intentions. An Edgar Award finalist! When the one-eyed wanderer called the Preacher sets out to avenge a murdered veteran, nothing can keep him from uncovering the truth, even if he has to take on every lawmaker — and lawbreaker — in town. The most fascinating passages are when The Preacher reveals the personalities of the prominent Farewell residents by joining in their late-night poker game. The betting and bluffing habits of those around the table, as well as their general behavior during the many hands, provide insights as detailed and accurate as any modern forensic or profiling investigation report. This same intensive insight is applied to the other town suspects and settings, even when poker is not involved. Thackrey livens these observations with doses of subtle and sarcastic humor, further enriching their depth and relevance to the plot. While a protagonist destined to a life serving God, who then abruptly changes direction and dwells among the multitude of ordinary sinners, is hardly an original concept, Thackrey managed to avoid most of the clichés that accompany the idea and made his Preacher distinctive and unique. This is a book that has a lot going for it. You get a sermon, a mystery, poker games and lore, a hero who's a former priest, a corrupt small town in the American southwest, a noirish sensibility, and some darn good writing.